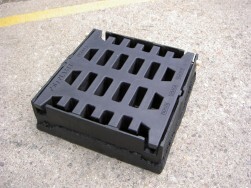 M508D Rovasco plastic street gully sewer grids are used for roadways and parking areas drainage . M508D is an updated version of the M500D grid which is no longer manufactured. M508D has a better flow capacity at the edges of gratings and therefore a higher utility value.